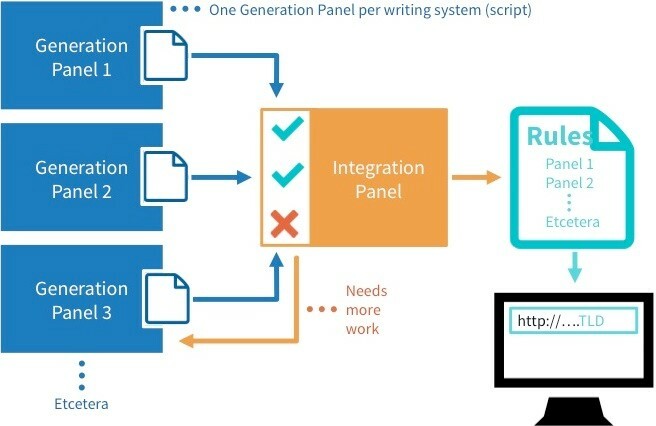 The Label Generation Ruleset for the Root Zone is the result of integration of Label Generation Rules (LGR) proposals for different scripts or writing systems, which have been developed by relevant Generation Panels and are successfully evaluated by the Integration Panel. The LGR proposals for the Root Zone, which have been submitted for evaluation, are listed in the table below, along with the proposal documents and their current status. Test Labels [TXT, 3 KB] Released for public comment. Test Labels [TXT, 13 KB] Submitted to Integration Panel for evaluation. Test Labels [TXT, 6 KB] Submitted to Integration Panel for evaluation. Test Labels [TXT, 7 KB] Submitted to Integration Panel for evaluation. Test Labels [TXT, 56 KB] Submitted to Integration Panel for evaluation. Test Labels [TXT, 8 KB] Submitted to Integration Panel for evaluation. Test Labels [TXT, 8 KB] Deferred for integration until LGRs for related scripts are submitted. Test Labels [TXT, 2 KB] Released for public comment. Test Labels [TXT, 117 KB] Integrated into RZ-LGR-2. Test Labels [TXT, 2 KB] Integrated into RZ-LGR-2. Test Labels [TXT, 4 KB] Integrated into RZ-LGR-2. Test Labels [TXT, 9 KB] Integrated into RZ-LGR-2. Test Labels [TXT, 7 KB] Integrated into RZ-LGR-1. Test Labels [TXT, 1 KB] Deferred for integration until LGRs for related scripts are submitted.